The Internet is growing day by day million of people are buying 3g dongle/net setter or modem to surf the internet on their PC, laptop. Why people buy 3g usb dongle? Because it’s the coolest way to connect to the internet anywhere with your laptop or tablet in a car, house, park, club, party etc. You don’t need to seat on your computer room with a wired modem. But when we buy these 3g dongles they are locked with a specific sim operator. You can use only that operator which is provided with that 3g dongle. Suppose their 3g plans are expensive but another operator gives faster speed with cheaper price. Will you buy another operator dongle? The answer is NO. You don’t have to spend money on the new dongle. I will show you simple ways to unlock your 3g dongle. So you can use any 3g operator sim with the same dongle that you have. Well, there are many software and online sites to unlock your data card by entering unlock code. You can get that unlock code from any software like dc unlocker but it's paid and getting many complaints so, I would suggest you to just ignore DC unlocker don't use it. instead of that, you can try any other software on google by searching for "unlock dongle" with your dongle model number. It will give you a better result and you will get results. Which are best for your dongle but if you want us to write the complete procedure for your dongle. Then just write the model number in comments and we will give you the solution. Download Universal Master code it's a free software. 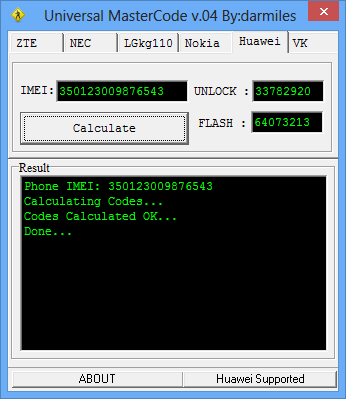 It will take few seconds to calculate the unlock code and Flash code. Now insert any other network sim and use that unlocking code to unlock. That's it. Now you can use any sim with your 3g data card / dongle / Net setter. if you still fail to unlock your device. You can ask me in the comment section I will definitely help you. Important: If you have generated the unlock code and inserted other company sim. But your dongle software is not showing you the unlock code option. Where you have to write the unlock code. That is because your dongle came with locked firmware. Actually, when sim company sells the dongle with under their label. They modify the dongle firmware so anyone can't use another sim in that. Just upgrade your dongle firmware. Don't think any dongle operator will give you the firmware to unlock their dongle and allow you to insert another company sim in their dongle. So you have to do this task manually. Every model has different firmware so, I can't guide you the exact way. That's why i will not write this tutorial but i will just guide you. Just search on google "your dongle company + model number firmware download ". for example "Huawei e8231 firmware download". You will get many sites which will provide you dongle firmware upgrade files with tools and complete tutorial. Note: Guys we write only to help you guys. So be relax and if you are struggling with unlocking your dongle just comment below with your dongle model number and IMEI number. We will give you the unlocking code and if you want complete tutorial we will write that too for you. If most people are asking to unlock the same dongle. Guys, i will surely reply your quires don't worry. Now is there any way to get the code for free and then apply using a software directly without having to flash anything? What username and password are we suppose to give in server options? Ok I apologized for that now I have mentioned it. Its paid service. Hmm I don’t think is there any free software to unlock dongle yet. when scan was completed a dialoge box has appearing like this " in order to detect device run DC-Ulocker as administrator" . 3 things you can do to solve this problem. 2. make sure you install phone drivers and update them if available. 3. if again your getting same error try on another pc. yes you can use same sim and other sim card as well for unlimited times after unlocking. But you need 3g sim and internet in it. I have a 3G Micromax dongle being used with BSNL 3G sim. Can I unlock it and use it for my SONY Bravia W670A LED tv? Accor to SONY, only Airtel E1731, Idea E1732, Reliance E173, and open mkt E303C/E369 (hi mini) are compatible. But, I don't want purchase another dongle. Hi...I am also having same problem with 3G tata photon dongle..Did you unlocked it or not? Is it possible to unlock 3G Tata photon Dongle? I have a problem with Tata photon 3G HSUPA USB Stick.I want to unlock this device and I would like to use aircel with same 3G device.. Is it possible to unlock 3G Tata photon Dongle? ZTE Corporation, Model : MF190. Please help me...I am waiting for your reply. i have a vodapone dongle which i unlocked and the connection works with 3 sim but everytime i connect the vodaphone homepage comes up and I can t get past it. How can i delete this home page can t access internet at all now! just change the home page of your default browser. what is your dongle model number? I have unlocked tata docomo 3g dongle with dc unlocker, when i insert sim card of vodaphone, sometime its detect and sometime not, but when detect i can not connect internet, I have 2g plan activated. I bought one new Micromax dongle MMX377G for 3G two days back.. I got 3g airtel sim and started to work but it does work. I am using it in a Laptop windows 8. I tried with Airtel for help. I can make calls from receive calls but there is no internet speed . Its not even opening for google search. what should I do ? whether the dongle not functioning ? Hello sir I want to unlock my MTNL 3G Dongle Model number is LW272.Which software i should download for it. Thank You!!!!!! i m waiting for ur reply..Vw. Dongle are wireless connection which you can take anywhere with your laptop. As you don’t have laptop I will suggest you to use broadband (wired connection) because there plans are cheaper than dongle internet plans and it’s faster and stable too. You need to go to Program Files, vodafone software for your dongle, open the file app.config in notepad and change home page address in that to google or whatever home page you want and save the file. This worked for my reliance dongle software so hoping should work in ur case as well. I have unlocked a Vodafone modem, but still the paint on its body is showing Vodafone symbol. Is there any software or trick,to remove that painted logo of Vodafone? Jts annoying. I've unlocked the DC still it looks like its a Vodafone dongle. And can anyone tell me when is india's semifinal match? Hi Bharat , does using another sim increases internet speed..?? might be every network operator has different speed with aircel i get less speed might be because more users using it in my area or anything else i dnt know but airtel gives me more speed than aircel and some people get more with reliance its depend. what will be speed if we use 2g sim?? micromax MMx377g or mmx 354g which is better? reliance or airtel which sim would work perfectly?speed of internet depends on dongle or ISP's sim? Hey if i give u my imei no. Of ma dongle so can u plxx send me the unlock code plxx..?? Please kindly answer my queries. Can this be used to unlock Lava 738G #G dongle as well? if i download this s/w then some charges also included or not ? Also if possible could you suggest a network that supports consistent 3g speeds in UP East circle, if I happen to unlock the device. Will WiFi work in my Airtel 3g dongle after unlocking it? I didn't get one thing .. suppose this sw ll unlock the dongle then what about the sim inside? how I ll able to use it for another network.. ? who i ll able to assign another vendor no to it? I have airtel 3g dongle but I need to use tata Docomo 3g sim card ? Is it possible ? I was tried before but it ask for login name & password ... What can i put ? Any solutions ? bharath gi.. mera question ka answer nahi a apke paas ? plz.. give me any solutions for that ? did you unlock it ? My evo wingle huawei ec315 modem is not detecting by dc unlocker ,i tried so many methods but all failed, plz give the soution soon, thanks in advance. Bharat i am using tata cdma mobile connection. I see that the speed is quite low on htc t328 3g mobile phone. Tata says it gives 2.1 mbps speed and on data card it gives 9.8 mbps speed. How can i increase the speed . This phone also has a hotspot option which helps me a lot. Why is there speed difference between mobile sim and data card. If i insert mobile sim in unlocked data card will i get 9.8 mbps speed. hi mr.sharma,,can i unlock MTS latest dongle..i dont see any card slot on the device? Hi Sourabh, were you able to unlock your device? Please help if yes. I have device with same model locked to reliance. ZTE AW3632 is not showing in the supported devices list. Is there a way to unlock it? Dude I appreciate for these great information. I've got an Infomark IMW-U300 USB dongle provided by YES 4G in Malaysia. The problem is that now I live in another country and I'd like to use my 4G dongle but using another sim operator, but this dongle is not a sim removable device. Actually sim card is on board and there is no slot on the modem. Would you give me some opinion in order to unlock this device? I find out unlock code & flash through universal master code,now I installed huawai master code writer but it is unable to detect com port.I also run CardLock Unlock tool but it showing data card not found.Pls help me. Have you Got unlock your dongle..same model of huawei i got in airtel 3g. Unable to unlock for other then airtel. i m ready to pay for it. i have tata docomo max 3g dongle, but the place where i live has only docomo 2g network. but i heard we can use reliance or aircel network too. how to use reliance network in docomo dongle? I hv entered ma username n password too....but it is saying that it is incorrect....so what to do now?? How to use the unlock code and flash code to my device - ZTE GL09P LTE wifi router?? I unlocked that one , but getting 2G Network only. How to change to 2G to 3G .Please help on this. you need to change some setting from your dongle software. you might have selected GSM in network section just change it to WCDMA Only or WCDMA Preferred for 3G. Hi Sir. Kindly help me in unlocking my dongle modem. The model is ZTE MF70 and it's IMEI No. is : 865401011747676. Your NCK/NP code is 040510648286 and SPCK/SP code is 616257758380.
just insert any other network sim and open your dongle software then just enter one of these two code one. hi i am from Pune, i want to a new dongle which is the best dongle and which is the best service provider for 3g.. please suggest me... waiting for your reply..
vodafone is good but expensive BSNL and tata docomo has good recharge plans. you have not specify your dongle budget so just buy any dongle which has wifi support which will cost about 1500 rupees Huawei Power-Fi E8231 and if you want something cheaper and reliable go for D link DWP 157 without wifi. I have Reliance 3G wifi GSM data card ,can you please help me to know unlock procedure? However I have tried your way which you have mentioned above but don't know what to do next? just insert another company sim and connect it with computer or laptop and open your dongle software which you use to connect with the internet then enter your unlock code in that software. I have an Aircel dongle, IMEI is : 867648016443606 I already unlocked the modem but, whenever i connect the modem with different sim, the modem doesnot get register in the network. I have checked with mobile doctor, it says move your modem to strong network, but here the network is all ok. Only this moment doesnot find any network.Please help. what is your dongle model number> did you try changing the profile of network from your dongle software? hey i have a micromax mmx210 3g dongle .Will it support reliance sim ? I have a wireless Interent dongle which says Model 2601 and it has Vodafone written on it few times. On battery pack, name is ZTE. I need to have it unlocked. What will be your charges and how will u be able to do it remotely. Thanks to your service in advance.I have airtel MF70 3G dongle.I want to unlock it,so that I can use other operator's SIM. IMEI no.865401016672192.Will u help me to get unlock code? Your unlock code is 37357672 and flash code is 45719483. just insert another operator sim and connect to your computer and open the connection software which you use to connect your net. just enter your unlock or flash code in it to unlock your dongle. Hi im using Zong super 3g winlge from Pakistan. device is Huawei e8231s-1. i tried to unlock code but i dont really where to put this code. when i insert another network sim. it appears your device is network lock and there is not option of putting unlock code. what i do? reply soon as possible thanks. if you don't see any place in your dongle software to put the unlock code. Then you must upgrade your dongle firmware. Actually when sim network company sell the dongle they modify the firmware and put their lock. So you can't use other sim. just search for your dongle firmware and upgrade with it. You will see the unlock option and you will be able to enter the unlock code. I have a ZTE reliance data card aw3632. It does not have a software and i Don't know how to unlock it. Please help. How to unlock reliance wi-pod 4G LTE device . so that other sim card can be used. I want to unlock my wingle huawei E8231s ,but it does ask for code after sim changed please help and i cannot download any firmware from net. yes there is always risk of damaging any device if you don't know what you are doing. just research a lot before doing anything. Help Me... How I can... or How/where i put this unlock code (about software universal master code)? can you guide How to unlock reliance wi-pod 4G LTE . Can u help with modem Airtel ZTE mf825a? Dear sir how can i unlock Micromax MMX444L Data Card? i wont to use all sim with my airtel 3g dongal. so Pls Unlock My Device. I want to konw,can we unlock Reliance wi-pod 4G LTE device. i am working on it. If it works i will post the tutorial on it. how to use jio 4g sin on my dlink 3g modem?? Serial no. of device (IMEI): 356904064880514. While putting unlock code , it's showing incorrect code. Please help. please guide me for further steps too ...Thanks for your support, U r my last hope .. !! I have Airtel Huawei wifi wingle and it's model number is E8231s-1. Hi Bharat, I have a Airtel 4G wifi dongle, i have bought jio 4g sim, how can I flash my Airtel wifi router so I can use that my new Jio sim in Airtel..
Hello, I have a Vodafone r216 mobile Wi-Fi manufactured by Huawei Technologies Co. Ltd. I want to use this router for other sim cards so please help me with the procedure. I cant afford getting it locked permanently.